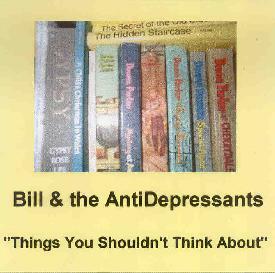 Bill & The AntiDepressants - "Things You Shouldn't Think About"
The Bill in the band name is one Bill Lehman, who has taken this pseudonym for his latest release, “Things You Shouldn’t Think About”. Bill comes from Columbus Ohio and has been a home recording artist for over twenty years. This latest venture has been a two-year work in progress. Bill plays all instruments involved, and the whole thing was recorded on 4-track in his home. The album is a set of ten songs. All of them are around three to four minutes long and all are set in the home recording feel. The drum machine patterns, metallic guitars, pounding basses, and ranting vocals all become one inside this experiment. The music dwells in the would be heavy/quirky mould. The instruments are well played as Bill takes his views out into the world. In my eyes the drum machine spoils things. I do not like them, but that will not hinder me in my review because I did not quite like the style of music he plays either. I can only describe it as almost thrashy guitar in certain tracks, jazzy in others, but always dirty. The songs drift, some heavy, none of them are ballads thankfully, others are interesting in sound, flanged, wah'd. The production is good considering the four track issue, and I think on the whole Bill has done a good job. "Backenese" I can get away with because it is just repetitive, strange and short, sort of acidic. However, my favourite track is the last track, "Plain & Pleasure", if I was to chose one, maybe because of the fact that the guitars flanger adds depth to the song, or the production is better. It's not spacey, rather warmer and more driven. I could mention Echo & The Bunnymen, or The Cure, but only as reference to the vibe it gives. The other songs are not like this though. They are more attempted heavy stuff, but the drum machine does not give them the power that they deserve. I will give Bill credit for actually doing his music with passion and spending time producing little ventures like this one. Fair enough I don’t like the music but that does not make it bad, its just not my cup of tea. Another reason I congratulate Bill is because I spent years four track recording at home, so I know what limitations you have. This all shows his dedication to the music and it is for that that I will not just call it poor. Keep it up Bill. For more information you can visit http://www.columbusmusic.com. Contact via snail mail c/o Bill Lehman; 1924 Baltic Ave; Lewis Center, Ohio 43035.